Although the broad averages have risen sharply in each of the last three sessions, none of these short-squeeze lollapaloozas has recouped the even bigger losses sustained earlier in the day. Do we detect a pattern here? The biztainment media seem to wax enthusiastic whenever stocks trampoline off some ugly low like Tuesday’s. But we shouldn’t lose sight of the fact that if the three-steps-down, two-steps-up dynamic witnessed in recent days were to continue for long enough, the Dow would eventually fall to zero. That will never happen, of course, even when the trumpets sound from on high. 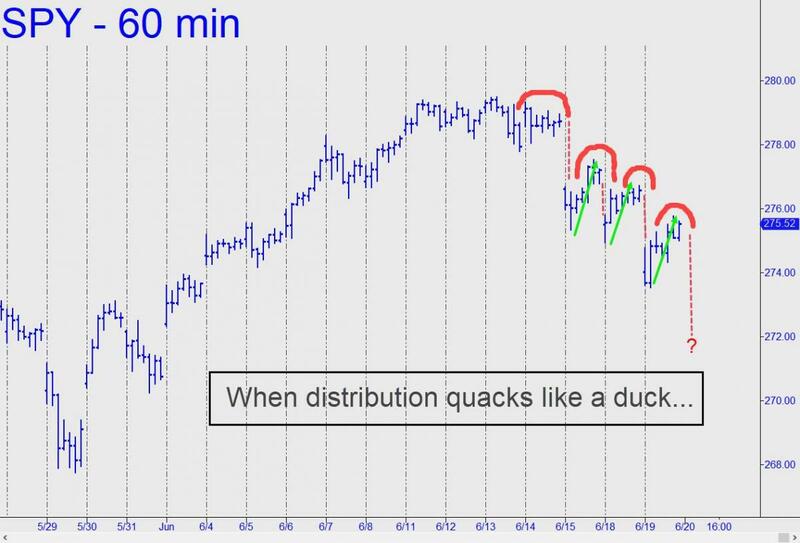 But it is a good description of how bear markets typically unfold — i.e., with shares initially falling on most days, gaining momentum until sellers are spent; then, rallying so spectacularly as to fill the crippled, wounded and maimed with hope. “Hope” is the last thing an investor should want to feel, the last refuge of the loser. Unless stocks are headed into summer doldrums — always a possibility — there will be opportunities galore to leverage Wall Street’s madness, which seems to be intensifying. My suggestion is to tune out CNBC and all the rest — especially when they are talking about tariff wars — and focus solely on price movement. You will be amazed to discover how stocks drive the news rather than the other way around. Join the fun at Rick’s Picks by clicking here for a free two-week trial subscription and a ringside seat in a 24/7 chat room the draws great traders from around the world.